It seems a lot of people were watching as the Donegal fighter was handed his first defeat in the UFC. 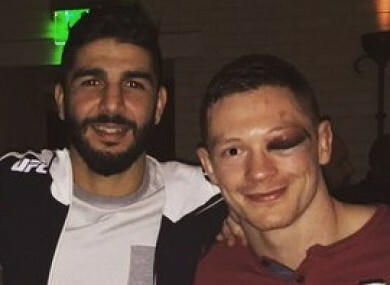 Joseph Duffy, pictured with Tristar team-mate Aiemann Zahabi, displaying his war wounds after Saturday's fight. THE RESULT DIDN’T go his way but there was some small consolation for Joseph Duffy after Saturday night’s defeat to Dustin Poirier. The fight, which took place at UFC 195 at the MGM Grand Garden Arena in Las Vegas, was the most-viewed in the history of Fight Pass, the UFC’s online broadcast platform. Beforehand, many fans were unhappy that such a high-profile bout had been relegated to the preliminary card. The early prelims were only streamed online via Fight Pass, while the main card was broadcast on BT Sport in Ireland and on pay-per-view in the US. However, it all appears to be part of a renewed strategy from the UFC to increase the promotion of Fight Pass. Poirier and Duffy were originally scheduled to meet in Dublin back in October, but the bout was postponed when Duffy sustained a concussion. The fight would have been available to Fight Pass subscribers and at a reasonable time for Irish viewers, so according to UFC president Dana White, the organisation wanted that to also be the case for their rescheduled bout, which began at approximately 12.30am Irish time on Sunday morning. If Duffy versus Poirier had been given a main-card slot — which it deserved, based on the quality of the two fighters — it wouldn’t have started until after 3am. White confirmed in the post-event press conference that the lightweight contest, which ended in a unanimous-decision defeat for Duffy, subsequently attracted more live viewers than any other bout in the history of Fight Pass, which the UFC launched in December 2013. “It broke the record. It’s the most-watched fight we’ve ever had on Fight Pass,” said White, who didn’t disclose specific viewing figures. The UFC boss also admitted that the organisation plans to increase its focus on Fight Pass in 2016, so don’t be surprised to see other main-card-worthy fights on the prelims as the year progresses. On 27 February, the platform will also host Anderson Silva’s bout against Michael Bisping, which headlines UFC Fight Night 83 at the O2 Arena in London. Fight Pass — for which a subscription costs €7.99 per month — includes an enormous archive of past fights from the UFC, WEC and various other promotions. It also streams a selection of preliminary bouts from pay-per-view events live, as well as main cards from lower-profile shows. Email “Joseph Duffy's fight with Dustin Poirier broke a UFC viewership record”. Feedback on “Joseph Duffy's fight with Dustin Poirier broke a UFC viewership record”.